The interchangeable lens Nikon J2 is not part of the classic D line-up (D3200, D800, and company) but an updated version of the company’s entry-level, mirrorless Nikon 1 series. As the name would suggest, the J2 is a tweaked version of the J1, a camera released to lukewarm reviews last year. The good news? The asking price has dropped to $549 with a 10-30mm kit lens, and the LCD screen is dramatically improved. 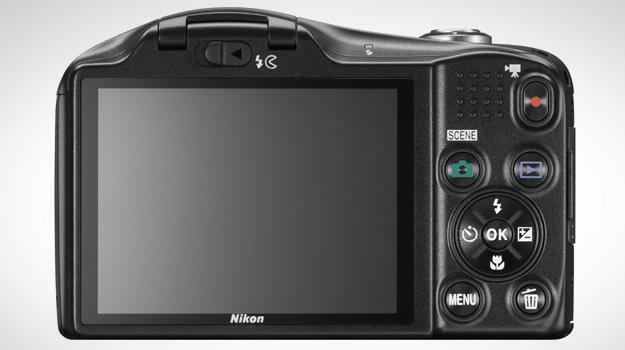 The 3-inch LCD display was bumped up to 921K pixels from 460K, which is similar to the more expensive Nikon 1 V1. One of biggest complaints about the original J1 was its steep price compared to the competition, namely the Olympus E-PM1. The J2 will leave the gap much slimmer. The bad news? The J2 still uses the CX format, a 10.1-megapixel imaging sensor of which we’re not overly fond. The camera works well in good light and with the flash, but in low light we found the images to be very soft. This sensor is much smaller than Micro Four Thirds and APS-C imagers. See our original J1 review for more details. 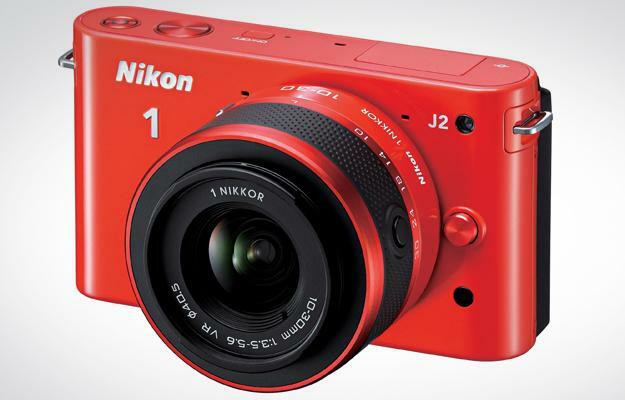 Nikon also enhanced the overall feel of the J2 with a metallic body rather than plastic, and added orange and red color options for those who want to make a fashion statement. Beyond pretty colors, a new Creative Mode setting was added to the mode dial. In our review of the J1, we complained there were no scene modes as a specific setting on the mode dial. We’re sure we weren’t the only ones griping, so it’s good to see Nikon make the adjustment. Turn to Creative and you can quickly move into panorama, miniature, night landscape, backlighting and night portrait settings. This will also get you into P/A/S/M modes, if you feel like flexing your photographic muscles. Nikon also announced a new lens for the series, an 11-27.5mm 2.5x Nikkor optical zoom that equals 30-74mm in 35mm terms. For those who like to take their cameras 130 feet underwater, the accompanying WP-N1 case will do the trick. The new housing ($749) is compatible with the J2 and older J1 with the 10-30mm lens. 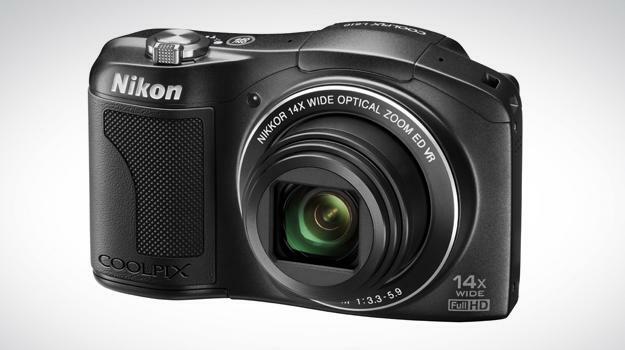 The company also announced the AA-powered Coolpix L610 ($249, due September), a 16-megapixel CMOS digicam with a 14x zoom (25-300mm). Beyond the 16-megapixel stills, the camera also shoots 1080p videos with stereo sound and has an HDMI out. Lens-shift vibration reduction to help eliminate blur and there’s a 3-inch LCD to frame and review your shots. The lens has two ED glass elements and lens construction consisting of 11 elements in 10 groups. For photographing close-up subjects, macro shooting is possible from as close as approximately 0.4 inches (at wide-angle setting). Like many new digicams offering Smart Auto or iAuto, the L610 has an Easy Auto Mode that automatically selects from among six Scene Modes including portrait, landscape, night portrait, night landscape, close-up and backlighting, to fit the most common scenes. A red dot movie-record button enables one-touch recording at anytime. Nikon plans to introduce additional cameras later this year, so stay tuned.